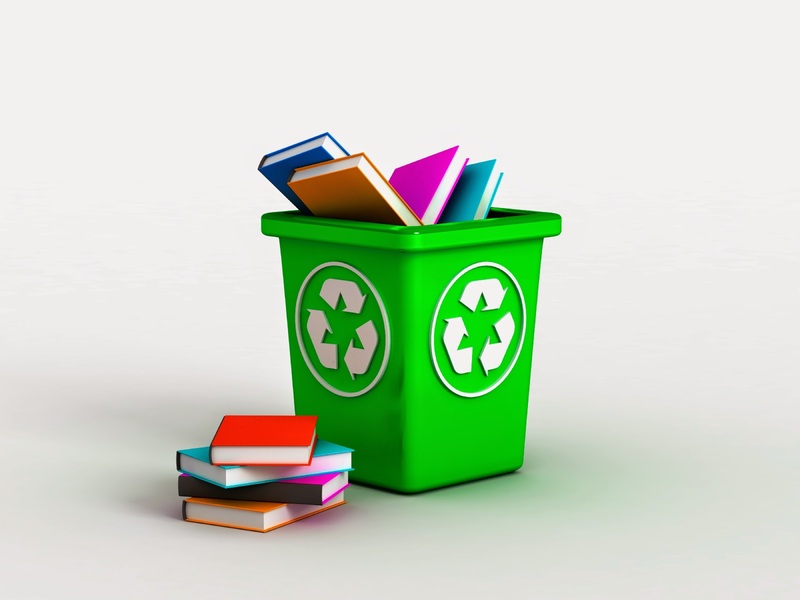 Recycling Works: Are Books Recyclable? off at a donation site. Sometimes, however, it becomes necessary to be done with it entirely and dispose of it. But where does this type of item go? Recycling softcover books is a common practice. They can go directly into your recycling bin or drop-off center as is. Essentially, this would be like a stack of papers and a cereal box being in the same load of recycling. Hardcover books, however, are a different story entirely. Most recycling centers request, or even require, that the covers be removed from hardcover books before being recycled. The bindings of hardcover books consist of a few different types of materials. First, there is a hard cardboard or cardboard composite layer. Next is a layer of adhesive, sometimes followed by fibers which help the spine of the binding to adhere to the paper block. All of these materials create a mixed-material substance which is generally not recyclable by normal standards or processes. According to rethinkrecycling.com, "over 2 billion books are published annually in the U.S. - about 6 books per person every year! It takes one tree to make about 25 books, so reusing or recycling books helps to reduce deforestation." Recycling books can be done, but reducing the amount of books being printed or allowing someone else to reuse them would be ideal. Reduce the amount of new books being printed by buying used books, borrowing books from libraries or friends, and downloading e-books. Local libraries use donated books to stock their shelves or sell them at fundraising events. Charitable organizations and thrift stores are able to sell good books to people who might not be able to buy expensive new ones. Hospitals and assisted living centers have patients that would love to be distracted by a good book. Trade your books with other bibliophiles on sites like Freecycle.com, PaperBookSwap.com, or BookMoocher.com. Sell books online or at local used books stores. If you must dispose of unwanted books, be sure to follow the guidelines set forth by your local recycling centers.